How to Keep Discus Fish Healthy – Discus fish are some of the most beautiful and impressive tropical freshwater fish kept in the aquarium hobby. They are also some of the most delicate and difficult to maintain. Discus fish are also expensive compared to most freshwater fish. Use these tips to learn how to keep discus fish. Prepare the tank by rinsing it with clean water. Also rinse everything that will be in the tank, such as gravel, plants and artificial decorations. Add the gravel to the tank and fill the tank with the half full of water. Place the plants, decorations, filter, and heaters properly in the tank. Fill the reservoir slowly and add chlorine remover to the water according to the manufacturer’s instructions. Start the filter and set the heat to keep the aquarium water at 85 degrees F. Add your starter fish to the tank when the aquarium temperature reaches 80 degrees F and keep them healthy for at least one week. This will start the biological filtering process inside the tank. Feed your fish only what they will eat in about 3 minutes and remove the uneaten food from the aquarium. 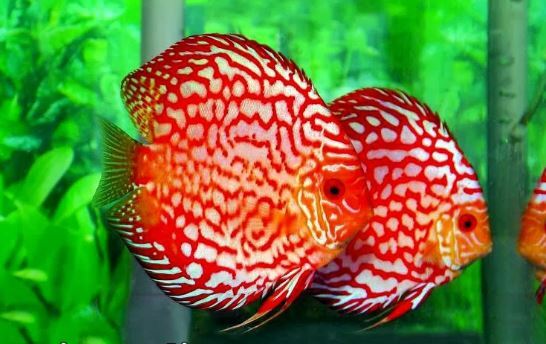 Purchase two or three healthy discus fish from a dealer or store with a good reputation. Discover the temperature of the water at which they were kept. Ask the dealer what type of food the discus is used to eating and getting some of that food. Discus fish are reluctant to change diets. Introduce your fish in the aquarium after making sure the water temperature matches what the fish are coming from. Give your fish at least half an hour to explore their new home and settle down, then give them some food. Change 1/3 to 1/2 of the aquarium water each week, but make sure that the temperature of the water you add is equal to the temperature of the water in the tank. Remove the chlorine from the water you add. Move slowly around the discus tank, especially when the fish are new. Discus fish are shy and can get hurt by running around the sides of the aquarium trying to escape. Discus fish are susceptible to disease and infection. Keep their tank clean.